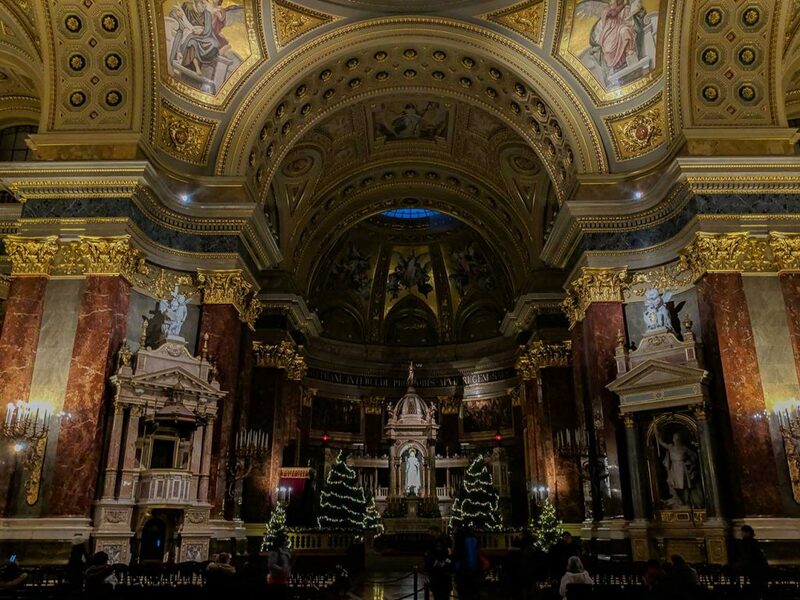 If you have a good view of Budapest, then you can’t miss St. Stephen’s Basilica. Standing at 96 meters tall, this gorgeous church is the tallest building in the city of Budapest. Well, it’s tied for the tallest, actually. Budapest’s parliament building and St. Stephen’s Basilica share the same height of 96 meters. This is to show the equality of church and state, the importance of spirituality as well as worldly affairs. A fun fact, these two buildings rise exactly 96 meters to represent the year 896, when Hungarians first migrated to this area. Indeed, the number 96 is quite important because no building is allowed to be higher than 96 meters. Pretty interesting stuff! If you’re still looking for that awesome view of Budapest and the Danube River, check out our post on Gellért Hill and Liberty Statue! Now let’s have a look at St. Stephen’s Basilica. 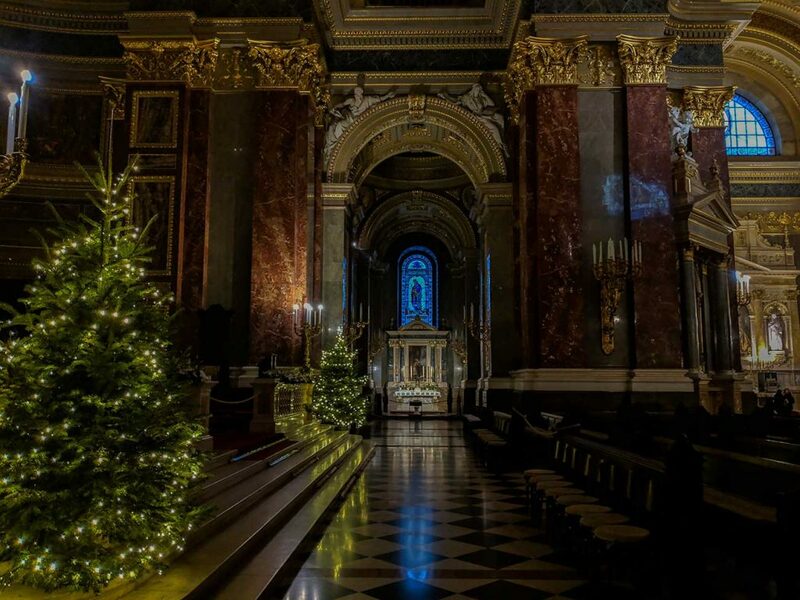 Luckily, it’s very easy to get to St. Stephen’s Basilica, as is the case with many attractions in Budapest. If taking the subway, which we recommend, you’ll want the blue line, M3. Be on the lookout for the Arany János utca station. The church is just a couple blocks south from there. If you’re looking for a little jaunt or sightseeing before heading to the church then you should stop at Deák Ferenc tér. There is a lot of shopping nearby and some good views of the Danube River. This is where the red line, M2, meets up with the blue line, M3. 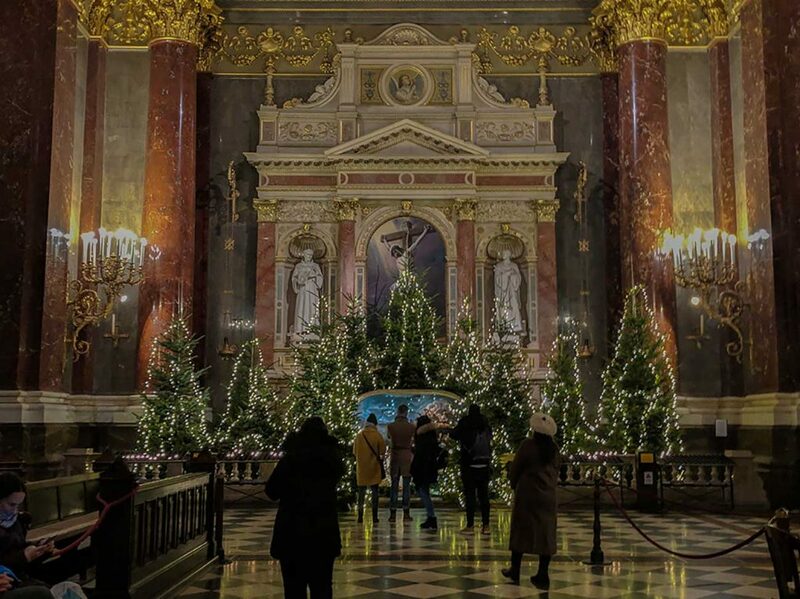 One of the cheapest attractions you can find, practically free, St. Stephen’s Basilica is beautiful and worth every penny. The Neoclassical architecture gives the impression that it’s much older but this church was actually finished in 1905, construction having started in 1851. 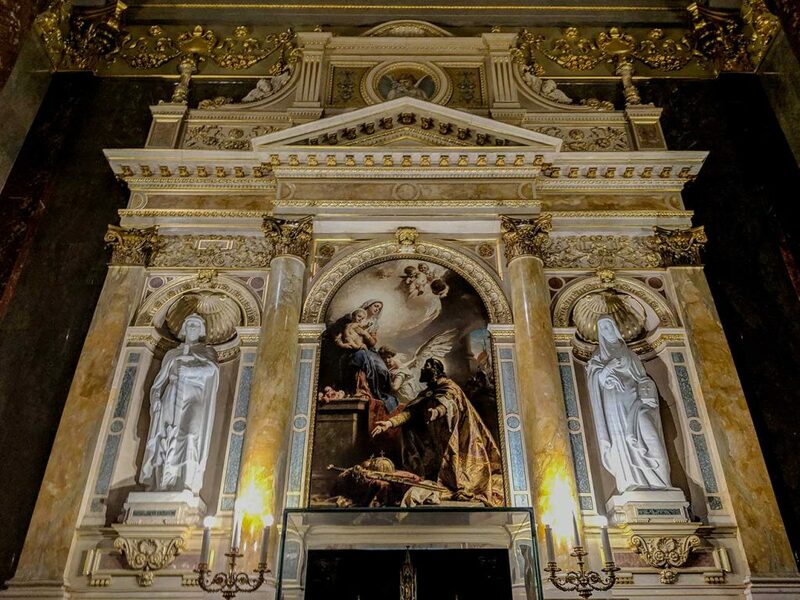 St. Stephen’s Basilica is dedicated to, you guessed it, St. Stephen! He was the founder of the Hungarian state and the first king. 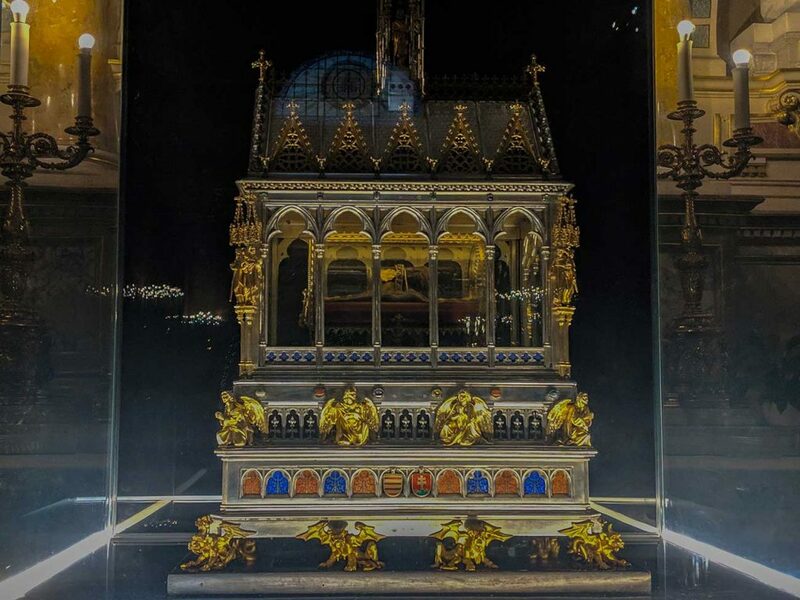 Probably the most sacred item in Hungary, the right hand of King St. Stephen is on display in a case. You can pay 200 HUF to light up the case. We were kind of expecting a small show but literally, it just lights up. Nothing crazy but still cool to see! Once you’ve admired the inside, take the exit but don’t leave yet! You’ll see an elevator on your right. Pay 600 HUF (around $2 USD) and take it to the lookout dome! 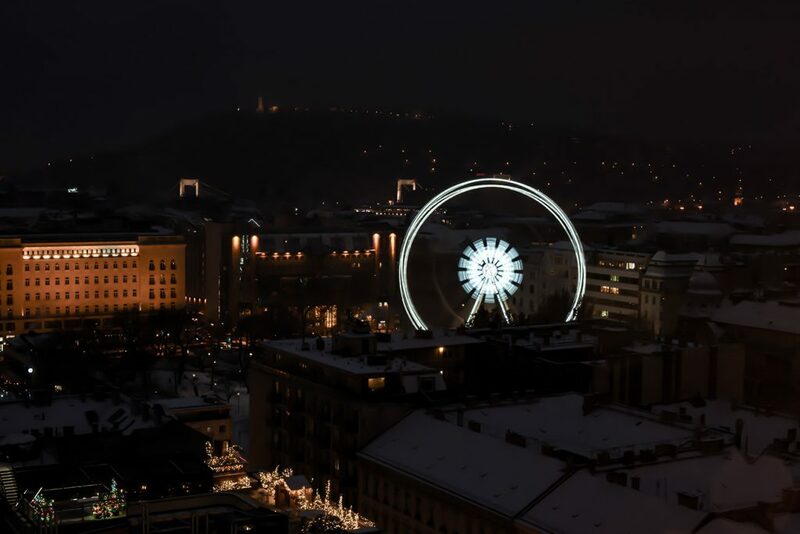 You can get a 360 degree view of Budapest from here. 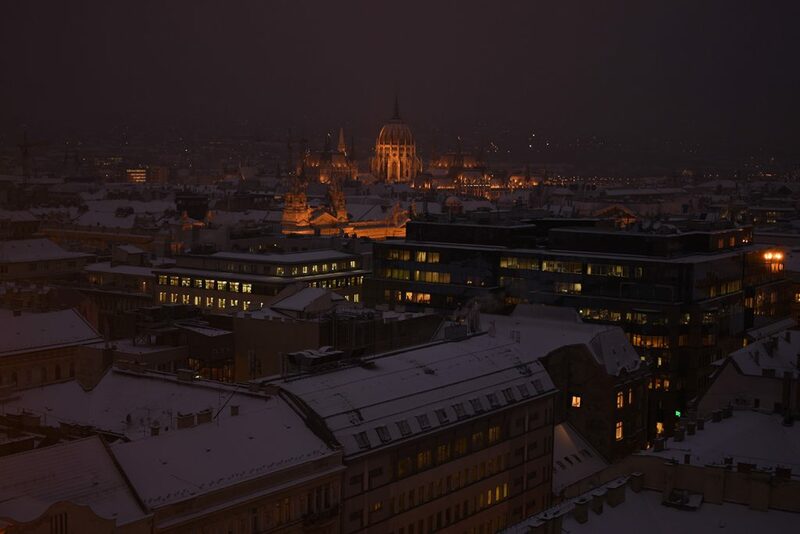 Accidentally, we visited around sunset and were lucky enough to see the lights of Budapest come to life. It was a sight to see! 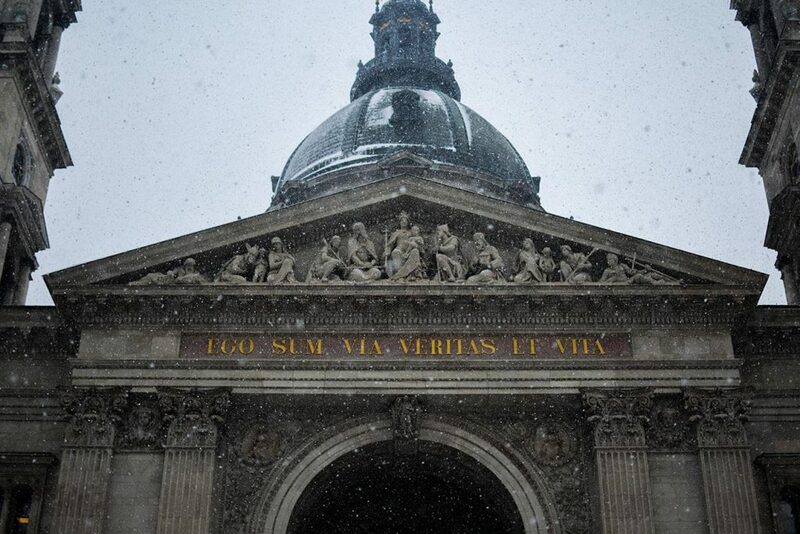 If we had one tip for St. Stephen’s Basilica, it would be to visit when it’s snowing! Planning that is near impossible, so we’re not serious about this tip. It had been snowing for hours on the day we decided to go and we even debated not going, but we’re so thankful we did. It was such a beautiful experience. 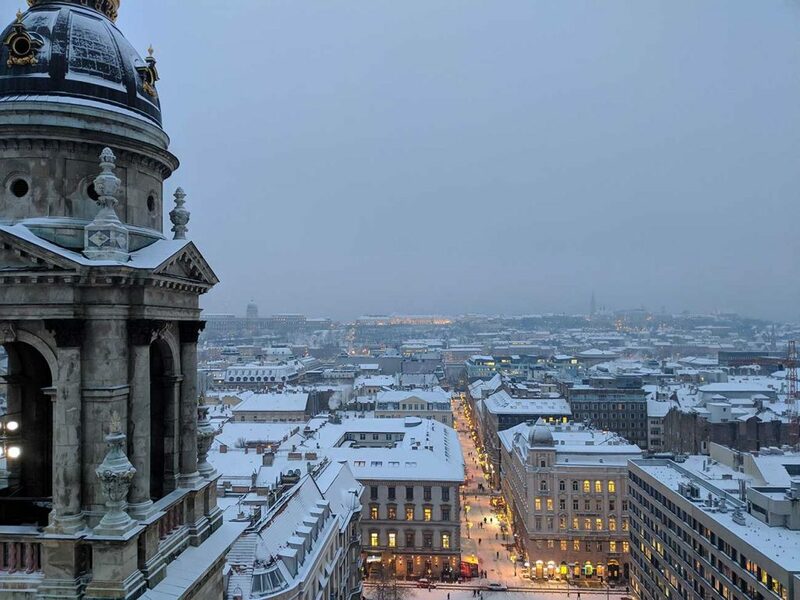 If you have the chance to see the snowy rooftops of enchanting Budapest and beyond then we beg you to take it. If there’s no snow in your forecast, don’t fret. You’re in for a real treat! Also, be on the lookout for organ concerts at St. Stephen’s Basilica. These take place during most of the year but unfortunately we didn’t get to go because they take a break during winter. If you do get to attend or have already been let us know how awesome it was! 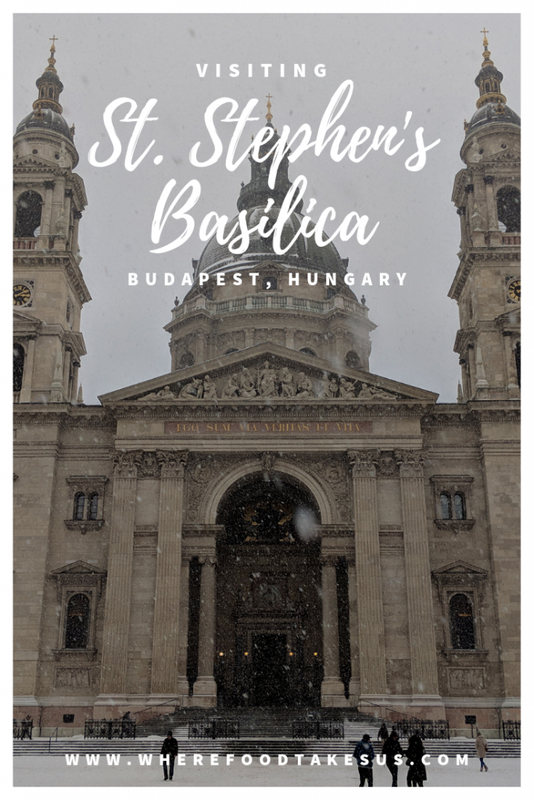 Go see St. Stephen’s Basilica! Happy travels and thanks for stopping by! I was in Budapest this past summer and spent most of my time pampering myself. I didn’t get a chance to see St. Stephens Basilica and I’m disappointed now. Though, I must admit, it looks much more angelic in the snowfall. 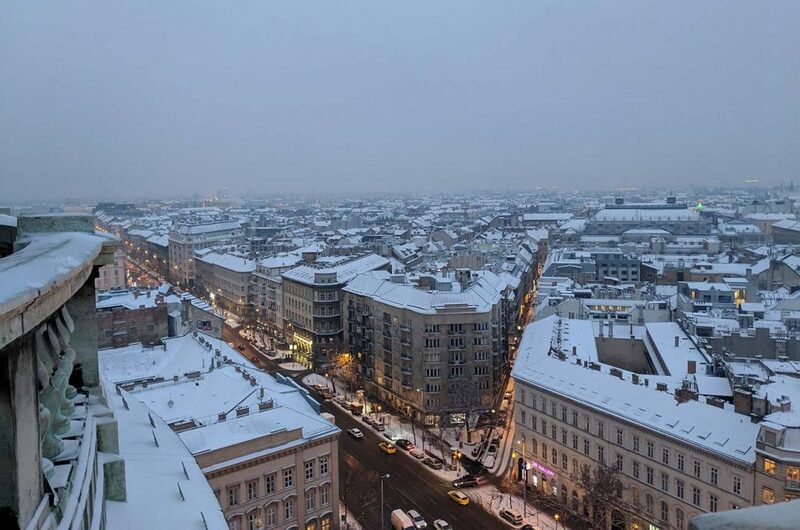 I’m definitely booking another vacation here to see Budapest in the winter time. Haha but pampering yourself sounds amazing too! The snowfall was beautiful and we really lucked out on that. Thanks for commenting. 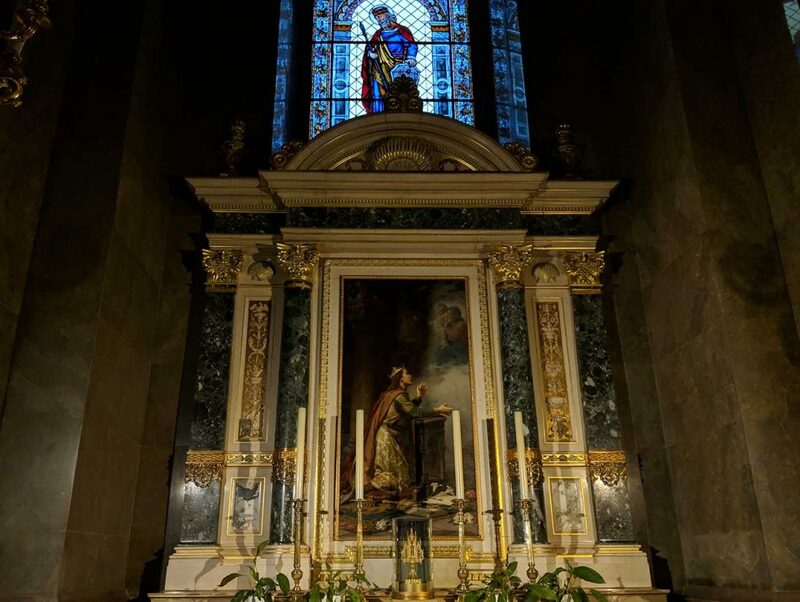 This basilica is one of the gorgeous I have seen online. The interiors are very intricately designs, and I could feel the oozing unexplainable appeal. Your photos look great, especially with the snow. 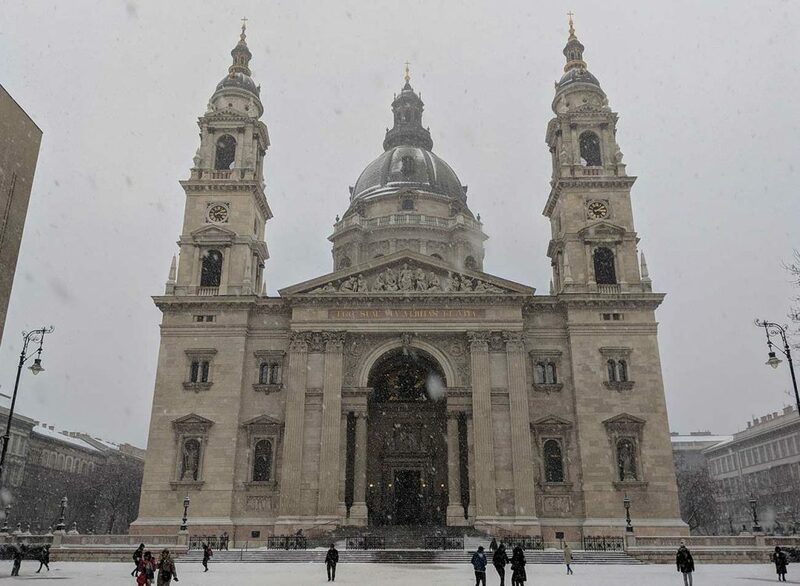 I’m planning a trip to Budapest shortly, I’ll add the Basilica to my list of places to visit.